cyclofiend: Single Speed Gallery Reaches 300 Bicycles! Single Speed Gallery Reaches 300 Bicycles! With today's update, the Single Speed Gallery has notched itself up to 300 entries. A pretty impressive number of one-speeds. A quick shout out to Mike Ferrentino, author of the Grimy Handshake column in BIKE magazine. It was his article some mumble-mumble years ago back in California Bicyclist which made me actually aware of the focused and self-flagellatory world of single speed mountain biking. Taking gears off your bike? That seemed crazy talk when I first heard of it, and yet it was oddly enticing. That article was one of the things way back when which gave the weather vane a good and hearty spin away from the normal and accepted practices. It's been interesting too, to see the number of singlespeeds which would be considered more "road" bike oriented. As readers of my main blog know, a comfortable and reliable frame designed for good clearances and large tires blurs the distinctions between on or off road, but the trend of this gallery has been more towards drop bar equipped models than a traditional mountain bike setups. I was really pleased to see this bike come into the queue at #300 (though I was equally chagrined that it wasn't Paul Germain's stunning custom Ellis). As most folks know, I own a Quickbeam as well, and consider it to be one of the best riding and most versatile bicycles I've ridden. But Ron's has some unique aspects to it - first of all, it reminded me of some of Grant Petersen's writings about how he sees Rivendell designs in the bigger scheme of things. He wrote some time ago that he hopes that his bikes stand the test of time, specifically that they will be recognized, sans paint and decals, in the future. That there are certain hallmarks of design and philosophy which will make people say, "...hey! That's a Rivendell!" And here, underneath a gorgeous clear powdercoat, is evidence of just that. The clean and simple lug lines. The good clearances. The useful braze-ons. 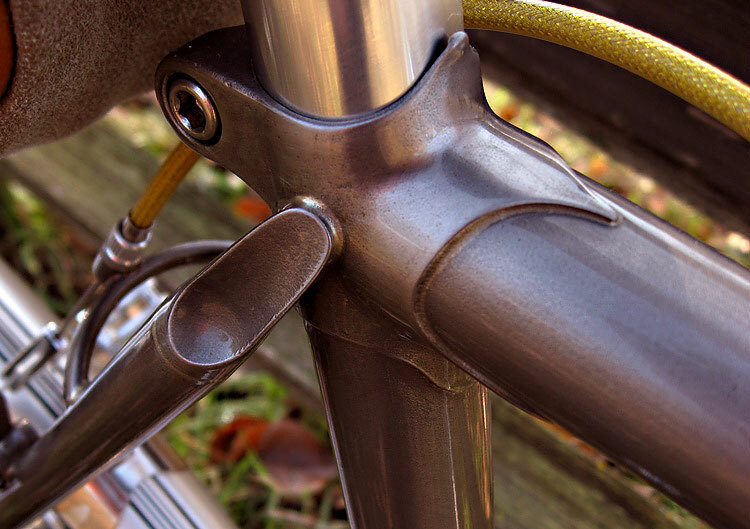 Those robust and cleverly angled rear fork ends. Yep, that's a Quickbeam.